Imagine a girl from Hawai'i (ME) in South Carolina. I'm craving yummy raw fish. (In Hawai'i we call it poke - pronounced po-kay). 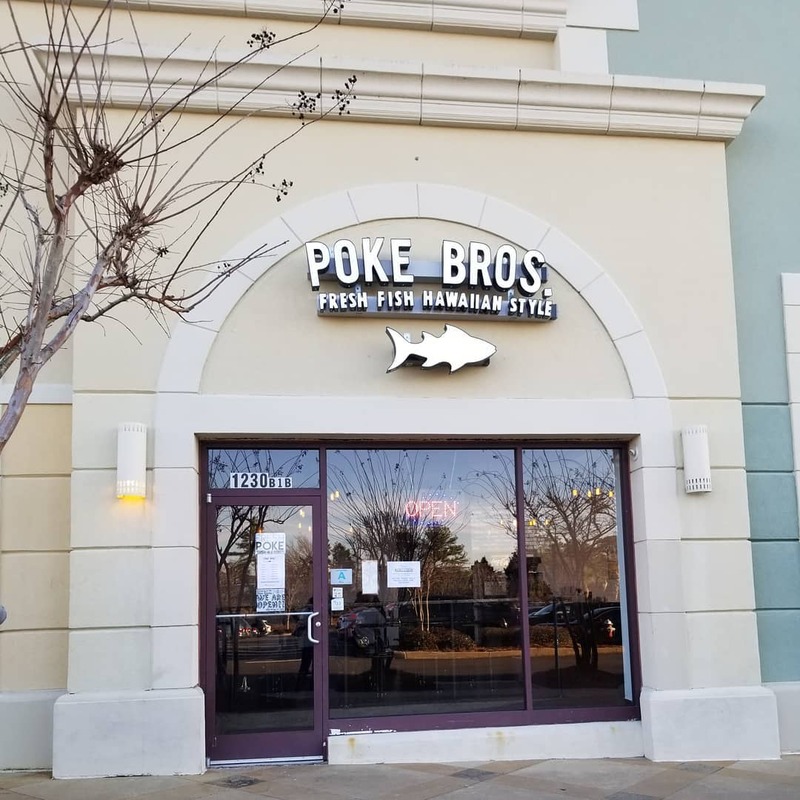 I'm walking up to the theatre to go watch a movie and to the right of the entrance is a restaurant called Poke Bros. "Fresh Fish Hawaiian Style". Of course, I'm going in there! Of course I want a taste of home whenever possible. I made a rookie mistake and did not grab a menu pamphlet when it was offered to me. It would have been nice to look at it now that I'm out of the store and ready to "review" the menu. Also it would have been nice to take a closer look at how they're marketing this "Fresh Fish Hawaiian Style". I am positive that whatever was on their pamphlet can be found on their website. Which, by the way, is well developed and to my surprise there are four restaurants that are already open here in South Carolina. Two stores that are within thirty minutes of me. And they are opening five more locations in this state. I didn't know that the interest in raw fish was so high here in South Carolina to warrant a total of nine stores in this state. Wow! In my opinion, this operation is a very cookie-cutter, assembly-line style restaurant that was conceived for the sole purpose of franchising. On the one hand, it's a great business model for the owner but on the other hand, the food suffers because there's just NO SOUL in this food. I suppose that sums up my review for Poke Bros - the bowl I ordered had NO SOUL in it. I have to compare it with the fish counters at home. 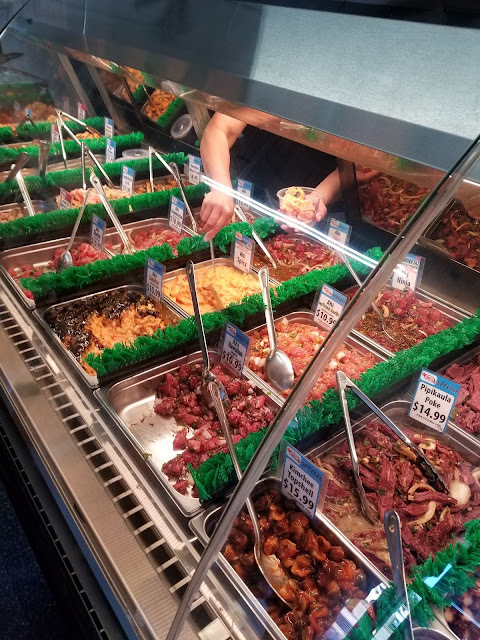 My #1 Favorite Poke spot in Hawai'i: FRESH CATCH | Kaneohe, O'ahu. 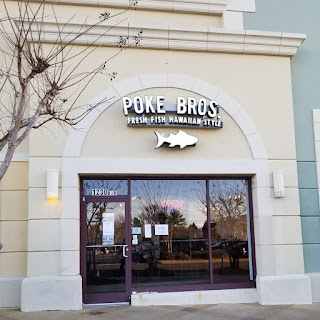 What you find at Fresh Catch that you will not find at Poke Bros are variations of poke from all types of ocean animals. I say animals because fish is not the only thing that is served poke-style in Hawai'i. There's tako poke. Tako is the Japanese word for octopus. The Hawaiian word for octopus is he'e, pronounced "hay-a". Octopus can be caught fairly close to shore in Hawai'i. As a teenager I often went with my father on his diving expeditions. When he didn't need to go quickly, he would allow me to swim along. We would stay in the water for hours. The only reason we would return to shore was because we were thirsty and hungry. I remember one specific time being out in the water for eight hours straight. Me and my dad! When he was out diving, his main search was for octopus and it was usually for someone's luau. I remember my father coming out of the ocean with loads of octopus still writing along his t-bar. He would tenderize it by beating it and pounding it in the sink or in a pot. Then he would hang it to dry in the sun. The he'e would turn a deep purple and white. Though there are some recipes for raw he'e, most times it is served after being dried or smoked and tossed with a poke sauce and green onions. There are two types of tuna that are most commonly served poke style. Aku, pronounced "ah-koo," is a skipjack tuna and was my most favorite fish when I was a child. I especially liked it dried. It is sort of like jerky. The high blood content is probably why I like the flavor so much. After it is caught, the blood rushes into the flesh and will turn black quickly. For most people that is not appetizing but me, I love it! The other tuna is the yellowfin tuna or better known as ahi. There's scallop poke - the scallop is cooked and tossed with a poke sauce. There's mussel poke - also cooked before tossing with a poke sauce. There's crab poke - raw and cooked variations. I feel like I'm rambling like on Forrest Gump when he talks about all the different ways of cooking shrimp. Because there's opihi poke, smoked meat poke, pipikaula poke. Seriously, the list can get extensive. The Hawaiian yellowtail or amberjack, known by it's Japanese name in Hawai'i -hamachi- is another great fish to use in raw preparations. The fat content is high in this particular fish, which makes it melt like butter when you eat it. So delicious! The list of ingredients could go on and on. Considering all of those ingredients and the variety of seafood at a typical poke counter in Hawai'i, Poke Bros is not a place I would consider a leader in "Fresh Fish Hawaiian Style." Sorry - it just isn't! I am almost offended that they even reference Hawai'i in their advertisements. It is what it is - clever marketing, exploiting Hawai'i's unique flavors.